What It's About: A series of interconnected love stories dances across London in the days and weeks leading up to Christmas. Love is found, love is lost, Denise Richards shows up at one point, soaring music soars. Who Loves It: Are you the one cousin who isn't bringing a date to Christmas Eve at Auntie Joanne's? (Besides Cousin Barry, obviously...) Does the song "All I Want for Christmas Is You" make you happy but also strangely a little sad? Is your bookshelf littered with Jane Austen novels and other Anglophile paraphernalia? Then Love Actually is almost certainly your favorite Christmas movie. What It's About: 1990s teen heartthrob Jonathan Taylor Thomas (JTT to his friends, seriously, call him that to his face if you ever meet him, he'll love it I'm sure) is trying to get home to see his girlfriend (riiight) Jessica Biel (riiiight) for Xmas, but of course a series of wacky misadventures keep him away from his beloved. 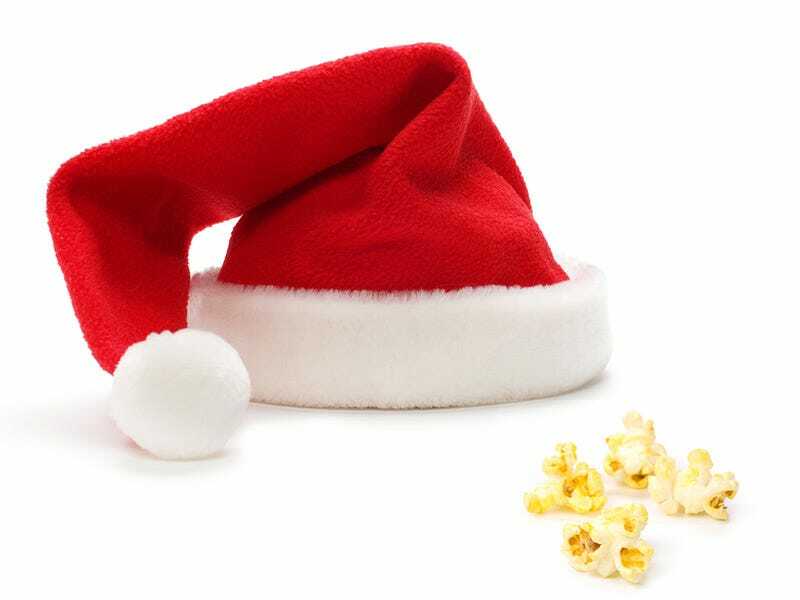 Who Loves It: If this is your favorite Christmas movie you have probably not the left the house for a long, long time. Newspapers have piled up, your once youthful teenage looks have faded into a strange gray pallor, all is lost, basically. Except the shrine is still going strong, candles flickering away, yellowing pages of Teen Beat still taped proudly to the wall, signed VHS of Man of the House still featured proudly in the center of it all. You haven't heard from anyone else in the fan club for years, but you're sure they're still out there somewhere, keeping the faith, same as you. What It's About: This curious 1985 movie attempts to tell the origin story of Santa Claus and then has a weird modern day story about John Lithgow being a mean businessman trying to corporatize Christmas. (Um... guess he won in the end?) Dudley Moore plays an elf. Very little makes sense. Who Loves It: Fans of Santa Claus: The Movie have drawer upon drawer stuffed full with retro graphic tees — old forgotten softball teams, old forgotten bands, old forgotten logos. They drink Miller High Life and like sitting on couches that smell musty. Very little of anything that's made nowadays is good or interesting to them, though it will be in twenty years. This person is kind of annoying. What It's About: Arnold Schwarzenegger and Sinbad teach us a valuable lesson about consumerism and greed in this tale about the quest for a hot toy right before Christmas. Hilarity ensues. Who Loves It: If this is your favorite Christmas movie, it means you were born in 1994 or something and I don't want to talk to you, because if I begin see you as a real person it will make it that much harder for me to drink your youth-giving blood when the time comes. What It's About: This is the glorious 1970 musical version of A Christmas Carol, featuring Albert Finney as the old miser (which Finney played at a young age) and classic songs like "Thank You Very Much." Seriously go rent it if you haven't seen it! What It's About: Santa teams up with the wizard Merlin to fight the devil to save Christmas in Mexico. Yup. Who Loves It: The same people that love this are the same people who love Santa Claus Conquers the Martians. They also love Chex Mix by the heaping handfuls, haven't been outside in like... a day maybe?, and they've never met a sweatpant they didn't like. Fans of this movie decided to stay back at school this year 'cause going home is such a hassle and Randy's staying here too and he's got all the sweet dank. Of course this person will feel guilty once the haze has worn off and it's actually Christmas day and their mom is on the phone and she sounds faraway, not even mad anymore, just let down. Bummer. What It's About: Seriously? You don't know? OK, so this guy George wishes he'd never been born because everyone's broke and hates him so an angel named Clarence shows him how miserable the world would be if had never existed. So life is affirmed in the end, etc. Who Loves It: Grampa. You should leave hm alone right now because he's napping, no he's not dead, sheesh, old people just need to sleep more than younger people. It's OK, you don't need to wake him up, he's seen this movie a million times. He loves this movie. He used to say "Way to go, Clarence!" every time he made wind. Your grampa's a funny guy. Now leave him alone. What It's About: This is the classic 1964 claymation movie about the lonely weirdo reindeer with the glowing red nose who finds a group of misfit toys to befriend, and then he ends up saving Christmas. There's also an abominable snowman and Yukon Cornelius. Who Loves It: Traditionalists. People who get their tree the day after Thanksgiving, who have garlanded all the railings and strung all the lights before December 1st. The Christmas traditionalist wears mostly red and green for the better part of a month, has many Christmas accessories, anxiously switches between the three all-Christmas music, all the time radio stations when driving to the Christmas Tree Shoppe to pick up more goodies, and has some very specific ideas about how to stuff a stocking. You love the Christmas traditionalist because they will take care of everything and you just get to swoop-in at the last minute and enjoy all their hard work. What It's About: A little boy sees a nun and a priest doing it at his orphanage one Christmas night and then grows up to be a murderous killer, escaping from a mental institution and impaling naked women on mounted deer heads, among other things. Who Loves It: The sullen, black-wearing teenager in your life! Christmas with them used to be all about cheer and togetherness and hugs and thank yous, now it's grunts and scoffs, doors slamming, aggressive music turned up too loud. Why are you ruining their life? Seriously, why are you? Art school is going to be so much better than living with you. They're going to sulk in their room all Christmas Eve and call their friend Ashlyn and be all "Have you seen Silent Night, Deadly Night? It's brutal. I love it." Ugh, this phase. This terrible, terrible phase! Who Loves It: Christmas Vacation is the favorite Christmas movie of primarily great people and/or me. Watch it, love it.